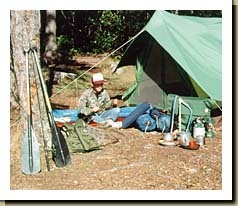 VIDEO - We have a video available that further explains BWCA-Quetico canoe trips. Contact us for details. Additional Links - You may find these additional links helpful in planning your trip. ORIENTATION – Trip routing, orientation, and all paperwork is taken care of at our downtown Ely outfitting base (conveniently located on Ely’s main street, across from the city park). Before you depart on the trip, we’ll go over the detailed maps, indicating the better campsites, fishing holes, and scenic points of interest. We will help you plan a route that best suits your needs, whether it be one requiring travel each day or a relaxing base camp arrangement reachable in 1-2 days. Orientation also includes instructions on use of our equipment, fishing and camping techniques, safety, and more. STARTING OFF – Complete outfitting includes a free van shuttle to the Lake One, Snowbank, Fall, Mudro, Gabbro, Farm, and South Kawishiwi River entry points. For those groups starting their BWCA or Quetico trips at Moose Lake we maintain a private base that includes on-site canoe rentals, towboat shuttle service, and free protected parking. Partial outfitting includes free delivery of rental canoes to the Lake One, Snowbank, Fall, Farm, and Burntside Lake entry points. For all other entry locations we provide cartop carriers or use of a canoe trailer (both free of charge). If you’d rather leave your vehicle at our downtown Ely outfitting base during the trip then we’ll provide a van shuttle to your entry point. Listed below are “one way” costs for a van holding up to 9 people using partial outfitting (most van shuttles are free with complete outfitting). We also arrange van service to Crane Lake, Isabella Lake, Saganaga Lake, and Kawishiwi Lake as well as to northern Quetico locations. Contact us for info and rates. Other items: toilet articles, bath towel, suntan lotion, insect repellant, first aid kit, flashlight, sunglasses, sharp knife, compass, camera, playing cards, paperback books, notepad & pencil. Fishing Tackle: rod & reel with 6-12 pound test line, small tackle box, lures such as spoons, crank baits, spinners, Lazy Ikes or Flatfish, Mr. Twister or feathered jigs, wire leaders, plain hooks & sinkers if planning to use live night crawlers or leeches for first few days, fish stringer. (We stock a complete supply of lures at our store).